We're located only 90 minutes from San Francisco or Oakland in beautiful Monte Rio on the Russian River. Take Hwy. 101 to River Road, west through Guerneville, at which point River Road becomes Hwy 116. Continue west on Hwy 116 to Monte Rio (approximately 22 miles of a gorgeous scenic route). At the three-way stop sign, you will see a large Quonset hut on your left with a beautiful hand-painted mural on the side. You've arrived! Don's Dogs cafe is located at the rear of the building, where diners may be taking in the sun on a beautiful round deck looking out over the river. Beside the deck twin "baby" Quonsets house shops run by local artisans. Once past the stop sign, veer to the left, driving under a metal arch welcoming you to Vacation Wonderland. You can park alongside the theater or in the large public parking lot across the street from the front of the theater. You can buy your tickets at the ticket booth. We accept Visa and MasterCard. You'll find lots of great places to visit in and around Monte Rio. We are a 15 minute drive away from the ocean and Goat Rock Beach. Armstrong Redwoods State Natural Reserve is also 15 minutes away. The lovely towns of Guerneville, Occidental and Jenner are all nearby, as well as are dozens of Sonoma wineries. 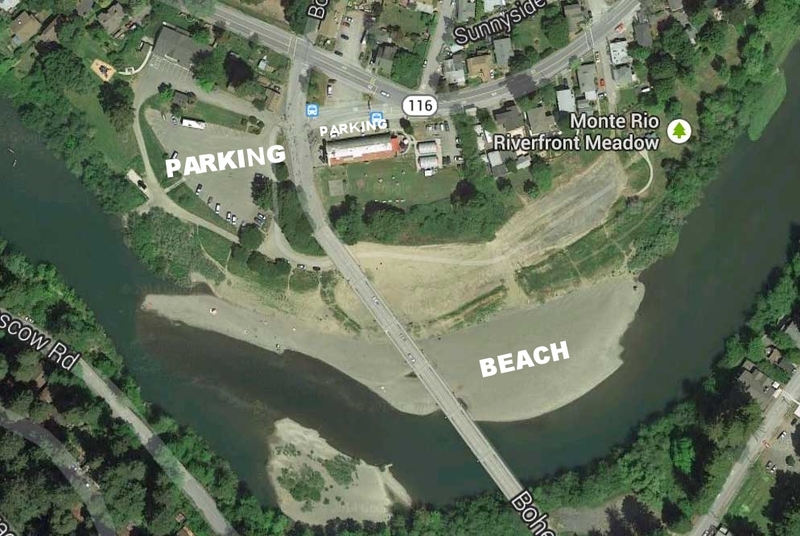 The Rio Theater is situated next to a great beach and a swimming hole by the Monte Rio Bridge.